1//that I get to celebrate my birthday with my parents tonight (a week later since we were gone last weekend!) I requested a taco bar and cherry pie for dessert. Cherry pie was just calling my name...anyone else love cherries this time of year? 3//the PGA Memorial Tournament has been going on here and we got tickets to go to the final round on Sunday! Usually, it rains all week long every year (and I mean every year) for this tournament but not this year. I can hardly believe it...dry and 80's. 4//my new Kate Spade crossbody that I found on major sale the other week. This red...yes please. 5//still loving this foundation that I switched over to recently. the best! I use this brush with it! 7//going all out for breakfast. 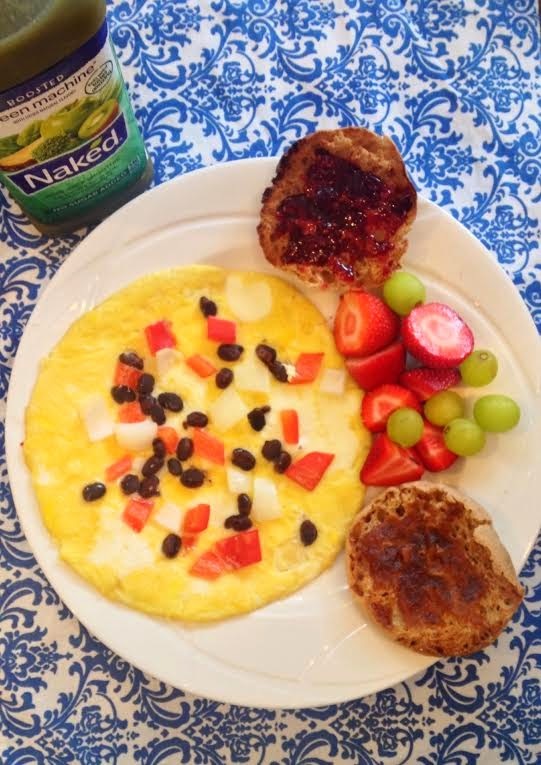 Breakfast is my favorite meal of the day and I love trying different combinations of my favorite things...this is 2 egg whites, 1 egg, black beans, red peppers, and onions and of course a yummy english muffin, fruit, and green juice on the side. 9//these Sambazon smoothie juices. I mentioned before I use the Sambazon acai frozen packets when making my favorite acai bowls (recipe here), but when I'm in a rush and need something on the go, these do the job! Very yummy! ....all these signs point to an amazing weekend ahead. Bring.it.on. Hope you all have a fantastic weekend with fabulous weather! Happy belated Birthday!! I am so happy it is sunny and warm this year for the tournament! 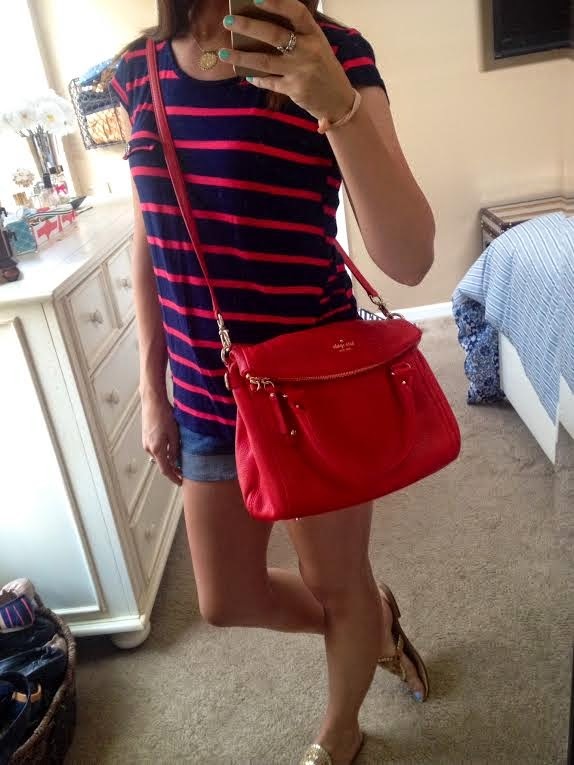 I am loving your new kate spade bag... that red!! And thanks for tempting me with yet another maxi dress... Like I need one more! Happy weekend friend! We're in SE Michigan, about a half hour from Toledo, and for my son's 3rd birthday in July, we're planning a trip to the zoo for this. I'm so excited! We aren't telling him where we're going, just waking him up the morning of his birthday, stopping at a waffle house on the way and then pulling in. Should be a fun 3 hour car trip. lol We're planning on staying the night somewhere, so any fun, toddler friendly brunch/breakfast ideas would be more than welcome! Love your new cross body bag - such a pretty and vibrant red!! I love cherries this time of year - just hate how expensive they are!!! You're like the 5th person to mention the tarte foundation - will definitely have to check it out!! Have a great weekend! I read your blog a few years ago, stopped following my Bloglovin' feed and recently started again. Still enjoying! Wanted to let you know PGA changed their bag rules this year (in case you were going to take that super cute Kate Spade!) and have been super strict about it! I went to one of the tournaments in Charlotte a few weeks ago and they wouldn't let me take in my flat cross body purse that was 6 x 7, the new rule is not larger than 6 x 6 x 6, and there are hardly any cute purses that small! My birthday is this weekend! I have always loved my summer birthday. Cherry pie warmed with ice cream is one of my favs. I have had my eye on a striped maxi as well and that Kate Spade purse is beautiful! happy birthday to you! hope you have a great time celebrating this weekend! Gorgeous red and KS purse, love it! Breakfast is absolutely the best meal of the day! Have a great weekend! Enjoy your weekend and your trip to the zoo! Love the red kate spade bag! I found a very similar one last year at TJ Maxx that I love! Thank you! TJ Maxx always has so many great options...love that store! I'm soo jealous about your zoo trip! It has been a hot minute since I've been. Maybe I'll try to squeeze in a zoo trip this summer with the two little boys I nanny :) Have fun! Breakfast is so much fun because you can get so creative! And having a BFF with close birthdays is the BEST-- my BFFs is one day after mine. Enjoy your weekend! I love your bag! Memorial Day sale? Your breakfast looks delicious! I'm still dying over your Kate Spade bag. I got a new one but yours is just SOO pretty! the bag is on sale again (in navy and mint) and i was thinking about getting it. Do you still love it?